Today's farm vehicles achieve traction by ballast. The ballast creates an adhesive force between tire and soil as well as between soil particles under the tire. This adhesion transforms axle torque into forward force. The tractor moves forward. And the soil under the tire is compacted. Tyres compress the soil slowly and steadily, preventing the intrusion of roots, water and air into the soil. The tyre tracks in a field reduce water infiltration and promote nutrient runoff and soil erosion. Beside directly reducing crop yields through soil compaction, tyre tracks also reduce the quality of drinking water, in the surrounding area, by promoting surface runoff that contains excess nutrients and pesticides. Furthermore, the current design of farm vehicles that generate friction on arable land is not energy-efficient. 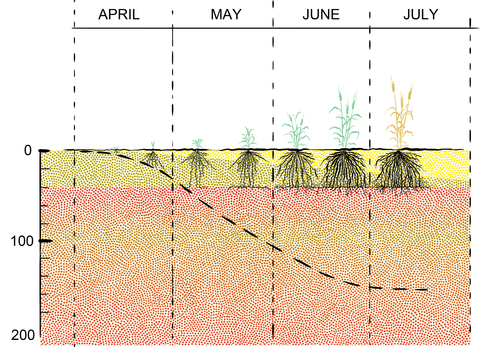 Above to the left you see an illustration of root growth over time in healthy soil. 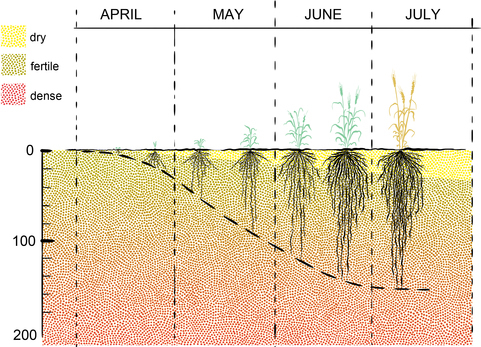 Wheat for example reaches a depth of 120cm, where the roots find important trace nutrients and where water is available even when the upper soil layers have dried out. To the right you see the effect of soil compaction. Roots grow flat and have no access to water in dry periods. Currently, the most important approaches to prevent soil compaction are a greater spread of contact pressure through low pressure floatation tyres and concentrating traffic on a few highly compacted lanes (Controlled Traffic Farming). Conservative tillage and no-till methods also have indirect effects of soil protection, by reducing the number of times soil is driven over. 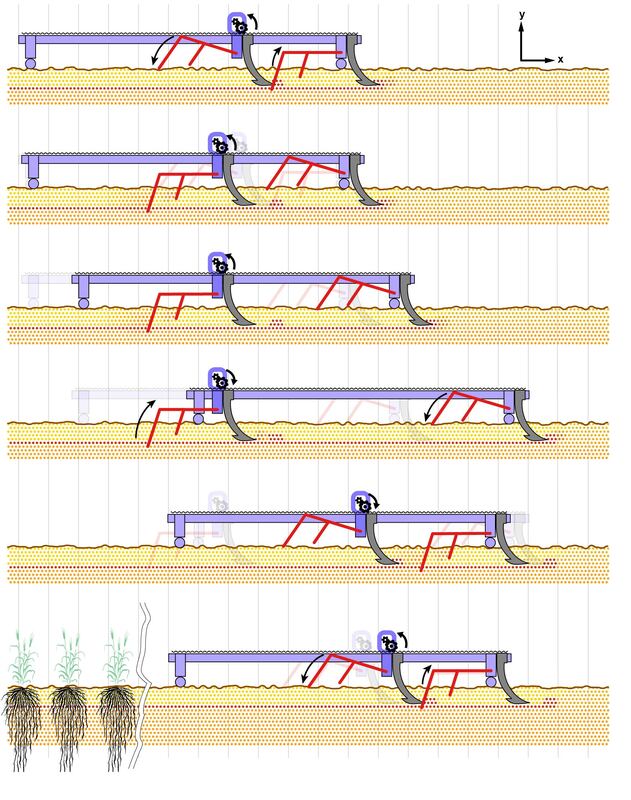 These are all partial solutions that either abandon part of the cultivation area to soil compaction or dispense with productive farm operations to protect the soil and replace such operations with increased dependence on pesticides. They do not allow a sustainable intensification of agriculture. A spike anchored into the soil and linked to a push-pull mechanism may be used to propel a machine in an alternative motion pattern. Once half the motion pattern of the push-pull is complete a second spike provides anchorage and the first spike is pulled from the soil.